I'm told that not only is Quenchy Cream a fabulous skin moisturizing cream, but that it makes a very nice beard balm as well. Before I began my bath and body hobby, I used to buy factory made soaps and creams. I bought the expensive creams at the department stores and the factory made soaps at the grocery store. Every year in the winter, my hands would become so dry, they would crack and bleed. I thought I had dry skin. When I started making and using handmade soap, I no longer had that dry skin in the winter or anytime. Furthermore, when I first made and tried homemade cream, I was amazed at how much better it was than the expensive department store creams I used to buy. I'm not just telling you this to sell cream-as you can see I made a video below showing you how you can make your own cream at home if you wish. I have just come to believe that just like with food, bath and body products are better and cheaper if you make them yourself. 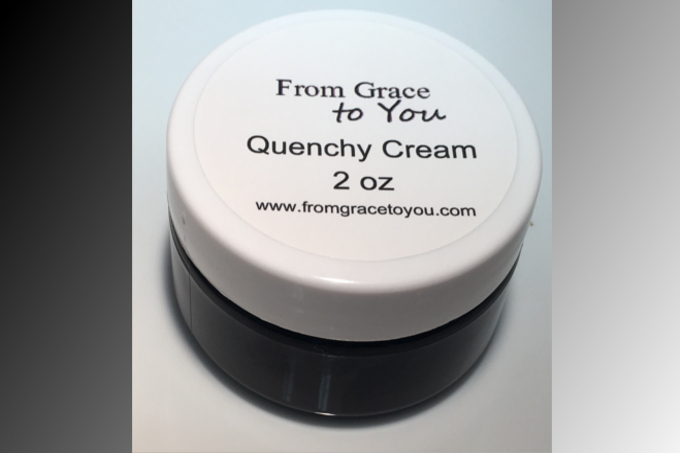 However, if you don't have the time or don't wish to make your own, I offer the product for you to buy.Quenchy Cream is a wonderful moisturizer made with natural, wholesome ingredients. So when you buy most lotions or creams you are buying mostly water. This water helps the product to be more spreadable onto your skin. However, when water is present, preservatives must be added to prevent microorganism growth. I make all of my moisturizers without water. That means that no preservatives are necessary. It also means that you are not paying for water. When you use these creams and moisture pearls, a little goes a long way. Quenchy cream is an excellent face cream. To use it, spread a very thin layer onto your skin. After waiting a short time for your skin to absorb all it needs, gently wipe your face with a clean cloth. If you like, you can wet your skin with a bit of water first, then apply the cream. This will help the cream to be more spreadable over a large surface such as your arms or legs. Glycerin is a humectant which means that it draws moisture to your skin. Grapeseed oil is easily absorbed and light on the skin. Beeswax offers anti-inflammatory, antibacterial and antiviral benefits. Kokum Butter Kokum Butter exhibits excellent emollient properties and high oxidative stability. Sweet Almond oil Sweet Almond oil has emollient properties, which gives it the ability to rejuvenate and soften the skin, thereby evening out the skin tone and improving the complexion. It also has been shown to protect and repair from sun damage. Jojoba oil Due to the similarity in molecular structure between jojoba oil and sebum, the oil that your skin produces,jojoba oil may slow the outbreak of skin breakouts arising from acne. It has anti-inflammatory and antibacterial properties. Babassu oil Babassu oil is light and non-greasy oil rich in skin protecting lauric acid and in anti-oxidant Vitamin E.
Argan oil Argan oil is rich in vitamin A and vitamin E. It is also packed with anti-oxidants, Omega-6 fatty acids, and linoleic acid. When applied to skin, it eases inflammation while moisturizing the skin. Evening Primrose oil Evening primrose oil is used for skin disorders such as eczema, psoriasis, and acne. Vitamin E oil Vitamin E functions as an antioxidant and has a role in anti-inflammatory processes. Watch to see how you can make Quenchy cream at home! Something that this page needs isn't supported by your browser!